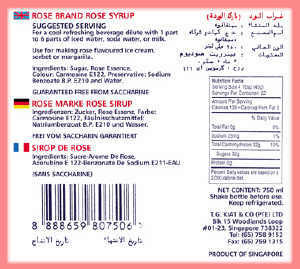 Rose Brand Rose Syrup is manufactured from Traditional Secret Family Recipe passed down from generations to generations. We only use carefully and specially selected natural Rose Extracts in manufacturing our Premium Product - Rose Brand Rose Syrup. 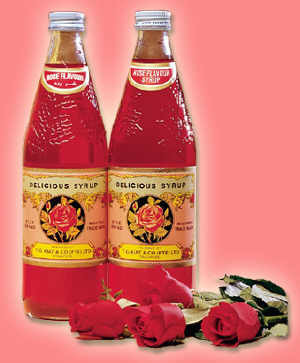 Rose Brand Rose Syrup gives pleasure and enjoyment to the consumer as one can really taste and smell the natural fragrance and aroma of the Rose flower accompanied by a very smooth finishing after drinking it. Look out for our great recipes on how to consume Rose Brand Rose Syrup. 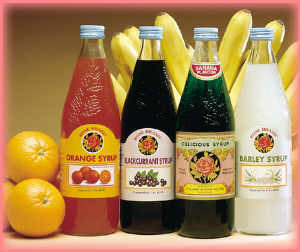 We also manufacture other flavours for syrup which includes : Banana, Barley,Blackcurrant and Orange. These flavoured syrups are just as popular and great tasting as Rose Brand Rose Syrup. They are made from specially selected ingredients that provides the drink with natural taste and freshness. Look out for our great recipes on how to consume our flavoured syrups. As we are currently exporting our goods to many different countries, we have labels in different languages to meet the requirements of these countries. Languages can be tailored specifically for specific countries like; Chinese, Japanese, Korean, Tamil, Arab, German, French, Spanish and many others. Contract Packing (in private labels) can be arranged.